​Sue works on her own in an old dairy making functional domestic and decorative high fired Porcelain ceramics. The pots are vibrantly decorated using Sue’s own glazes. Decoration includes abstract and pictorial images and more recently paintings of flowers and birds. 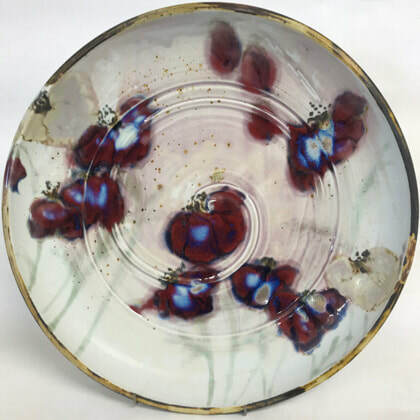 Large hanging platters are paintings as well as useful for serving a salad or a large roast on. Sue welcomes commissions and the studio is open to visitors throughout the year. A sign at the top of the lane indicates if the studio is open. Sue also has work for sale at the St Briavels produce market which is on the first Saturday of every month. She sells her work in Potters in Bristol and in various galleries.